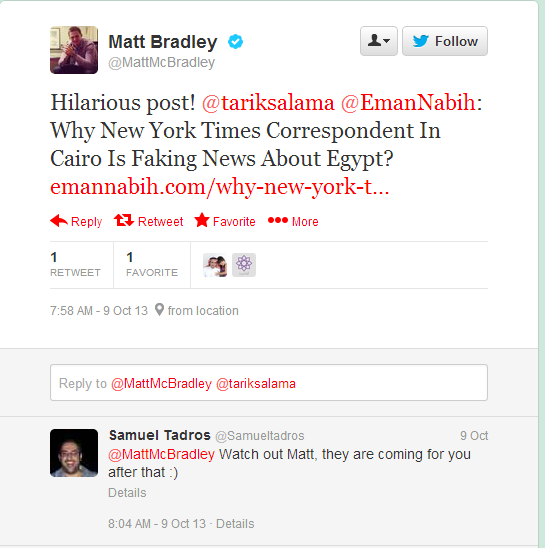 On 9/10/2013, I published an article asking Why New York Times Correspondent In Cairo Is Faking News About Egypt?. My main point in this article was concerning the dates and the in advance direct serious accusations addressed by the New York times to the Egyptian security forces of killing 53 MB supporters, while the autopsy final reports haven’t been released yet and the investigations are not over yet! 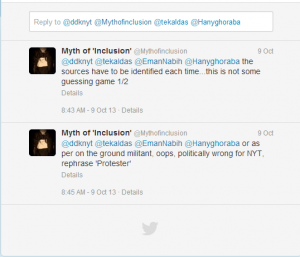 And also the claim of New York Times, that Muslim Brotherhood supporters protests are peaceful, while they were violent! 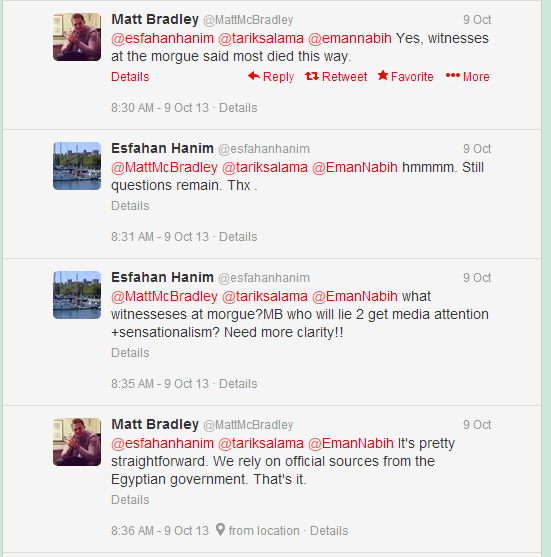 My point was not at all about New York Times Publishing the numbers of 53 dead bodies. 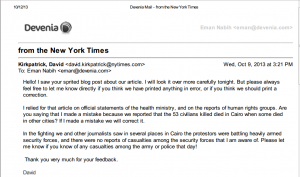 On 9/10/2013, I received an email from David KirkPatrick the correspondent of New York Times, asking me to feel free to let him know directly, if I think that they have printed anything in error or if I think that they should print a correction. He also mentioned that he relied on his article on official statements of the health ministry and human rights reports groups, and wrote that him and other journalists saw in several places in Cairo, demonstrators battling heavily armed security forces. He also asked me if I think that he made a mistake by reporting 53 civilians killed in Cairo when some died in other cities and if he made a mistake, he will correct it! 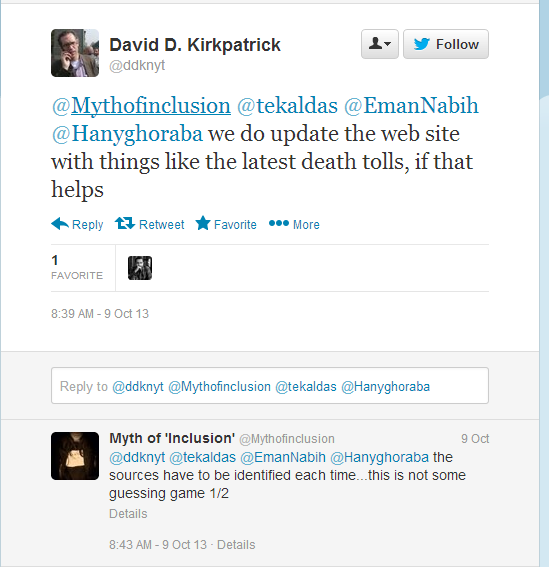 No, Mr. David KirkPatrick, that was not my point. The point in my article was clear. Based on your article, You published a violent event which took place in Egypt on 6/10/2013, then the next day dated 7/10/2013, the New York Times published and addressed serious accusations and condemned in advance the Egyptian Security forces of killing 53 MB demonstrators, while till this moment we speak, the autopsy final reports haven’t been released yet and the investigations are not over yet, and the concerned authorities haven’t announced who killed who yet, but New York Times directly accused Egyptian security forces of killing 53 persons based on your article dated 7/10/2013! That was my main point and question: Based on what proof, you wrote and published that the security forces killed those 53 demonstrators? I even asked you to go and put your testimony in the general Attorney Office and inform them of the name, ranks of the Military and Police Individuals you saw with your own eyes killing 53 MB demonstrators, or at least describe to investigators what they look like (you recognize their faces, don’t you?) and save the investigators time and efforts to present the killers right away to Justice! Another point was also addressed in my article, that the New York Times and other International Medias, when publishing to their audience that Muslim Brotherhood are demonstrating peacefully and you directly accuse the security forces and the Egyptian government of oppressing and locking in jails peaceful MB demonstrators and Leaders based on fake charges, and you don’t show any evidence on what you are claiming. 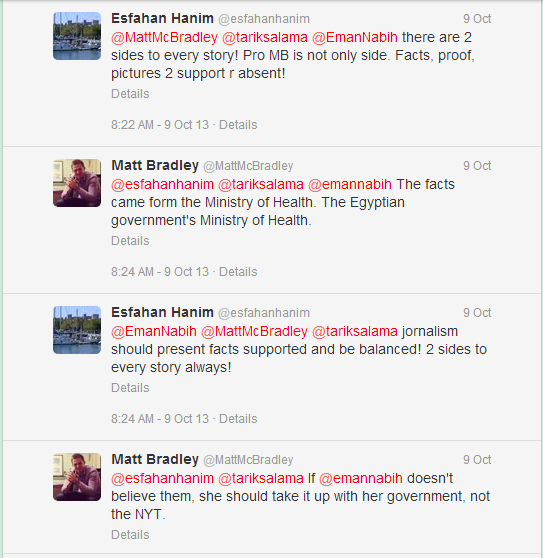 You also don’t mention any news about MB supporters violence! When International News Medias shoot accusations without any evidence, you guys are turning the International Public Opinion against my country. Please be my guest and read the comments on David KirkPatrick’s article, specially those who commented that what happened on 30/6/2013 was not then a revolution but it was a Military coup, based on the serious accusations published on the New York Times article! Reading about you claiming MB are demonstrating peacefully, I personally feel like I’m sitting fishing in Alaska while reading News about Aliens from Planet Mars!!! 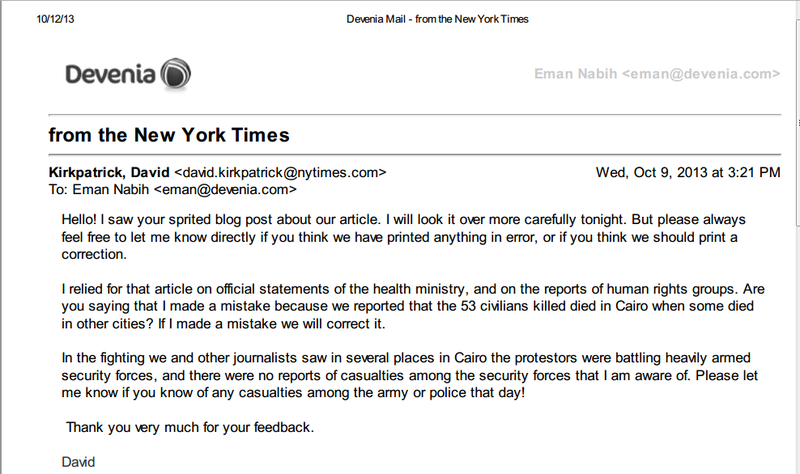 David KirkPatrick also mentioned in his email to me that he and other journalists saw in several places in Cairo, demonstrators were battling heavily armed security forces, and there were no casualties from the security forces that he is aware of! And he asked me to let him know if I’m aware of any casualties among the army or the police! So David KirkPatrick, are you asking me on 9/10/2013, to correct you and other journalists, after you guys published on 7/10/2013, that it is the security forces who killed those 53 demonstrators? And having no casualties from the Security Forces, gave you the right to accuse them of killing 53 demonstrators without proof! I thought that as you mentioned in your email to me, that you relied on what you saw with your own eyes and your sources were human rights groups and health ministry?! Now you want to rely on me for more accuracy???? If that’s what you and other journalists saw with your own eyes, Mr. Correspondent which is according to your own words emailed to me “battling”, why then did you write in your article that the security forces killed 53 demonstrators, instead of writing what you mentioned in your email to me that you saw a battle, and not security forces actually killing 53 demonstrators? 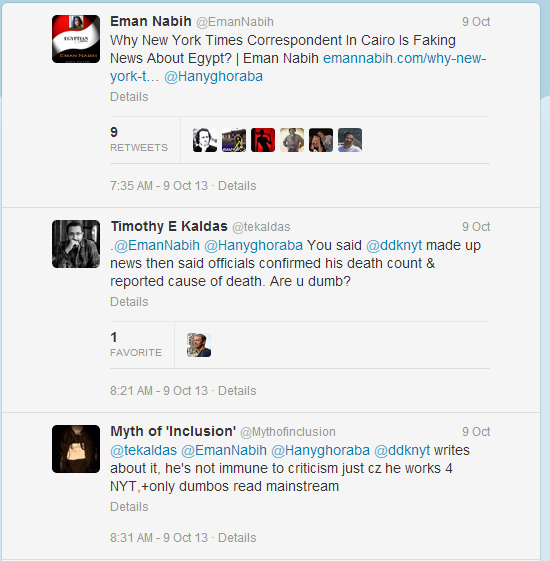 Another point, New York Times wrote that the 53 bodies were killed in Cairo, and David KirkPatrick wrote in his email to me that him and other Journalists saw the battling in several places only in Cairo City, while the total of 53 killed persons took place in 4 cities: Cairo – Giza – Beni Suef and Minia! 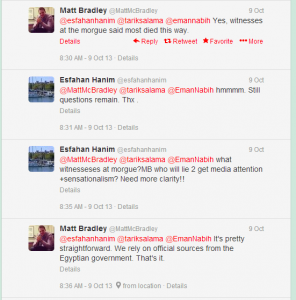 So, how come David KirkPatrick and other journalists were in different places only in Cairo and on the otherhand, they confirmed that the security forces killed all the 53 persons, while the killing took place in 4 different cities in Egypt? I guess we can say that Technology makes miracles here! or maybe Mr. David KirkPatrick and other Journalists are the International Medias Flying Supermen or perhaps, they were living the Déjà vu Egypt on the 6th of October 2013! 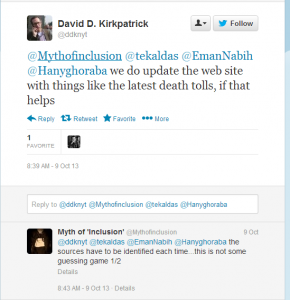 David KirkPatrick also mentioned in his email that he relied on official statements of the health ministry and human rights groups! Did those two sources of information tell David KirkPatrick about the numbers of death and injuries or they informed him that the bodies spoke to them and made their last confession, that they got killed by the security forces?! Maybe that’s why David KirkPatrick accused the security forces of killing 53 demonstrators because it’s impossible that one correspondent or many can be physically in 4 cities at the same time or even in different places in one city at the same time, to watch with their own eyes the killing of each of those 53 persons by the security forces as the Correspondent of New York claimed?! The following is a screenshot of David KirkPatrick, the correspondent of New York Times email to me – Click on it to Enlarge it. I believe that International News Medias disrespect and undermine the Egyptian People, every time they publish lies about what is really happening in Egypt that we Egyptians are witnessing daily on the real ground. I’m asking the Egyptian Concerned Authorities and the Egyptian Ministry of Exterior, to do their homework and take some official actions and measures towards not only the New York Times serious accusations, but towards any International News Medias who don’t respect the Media Code Of Conduct in spreading fake and lies about what is really happening in Egypt, and are working hard in turning the International Public Opinion against Egypt. 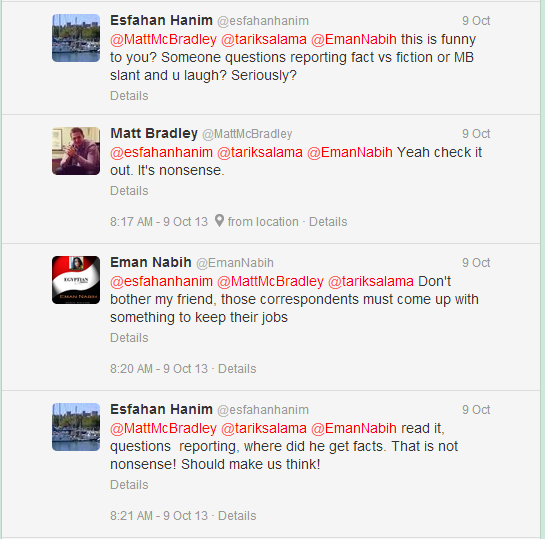 The last thing I want to point in this article, which has relation to the issue I’m highlighting here, is the reactions of other correspondents on the Social Medias like Matt MC Bradley, Middle East Correspondent for The Wall Street Journal in Egypt and Iraq, and Erin Cunningham Mideast-based journalist in Cairo, Cliff Cheney, Journalist, Photographer in Cairo – Egypt, and Timothy E Kaldas Photographer, Professor of Politics at Nile University, who offended me after publishing my article about Why New York Times Correspondent In Cairo Is Faking News About Egypt? 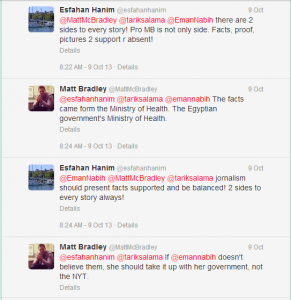 It is not that I’m taking their offends to me personally, but it is just to show how those correspondents who supposed to be neutral in publishing news and not taking anyone’s sides in publishing news about Egypt, but they are not really neutral. And that was obvious from their tweets as a reaction to the ridiculous, hilarious, nonsense, rudeness, hysterical, and conspiracy theory article of mine, as they described it! I’m an Egyptian who have the right to question every single word, International News Medias reporters are airing or publishing about my country, Or you guys have another opinion about my legal rights in my own country!!!? I’m not a professional Journalist or a reporter like you guys, I’m an Egyptian Blogger, who document what I see and live daily, But you guys, are certainly the kings and queens of the International Medias Here in Egypt! 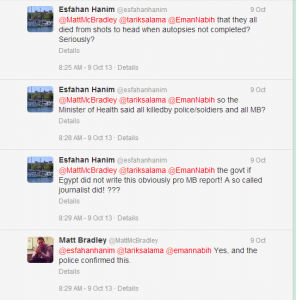 I’m just asking you one question: Provide the proof that those 53 killed on 6/10/2013, were killed as New York Times Confirmed and you guys are hinting, by the Egyptian Security forces???? Which part of my question, you didn’t understand!!! 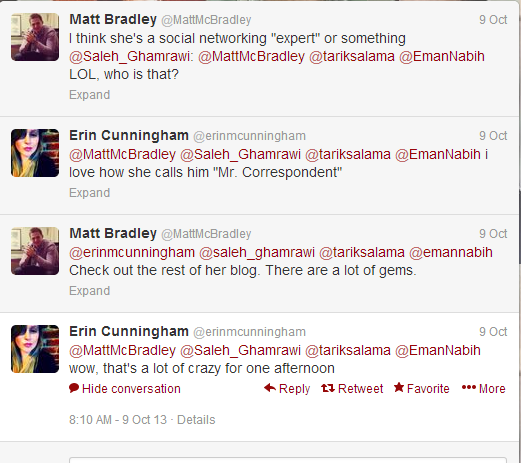 I was offended by Matt MC Bradley, Wall street journal correspondent and Erin Cunningham Mideast-based Journalist in Cairo,Cliff Cheney, Journalist and Photographer in Cairo and they made fun and ridicule all my posts which I documented since brotherhood got in power to show the world the Muslim Brotherhood crimes that they are committing against Egyptians daily. I don’t think that the Victims who got tortured and killed by Muslim Brotherhood and their supporters are subject for entertainment or to laugh and make fun of, here! And Millions of Egyptians, did not make a revolution in the whole country on 30/6/2013, so you guys, can come now and turn the International public opinion against my country, by claiming fake news and hiding the truth about Muslim Brotherhood Supporters violence against the whole community! And claiming that Egypt is divided, while Egypt is fighting terrorism. 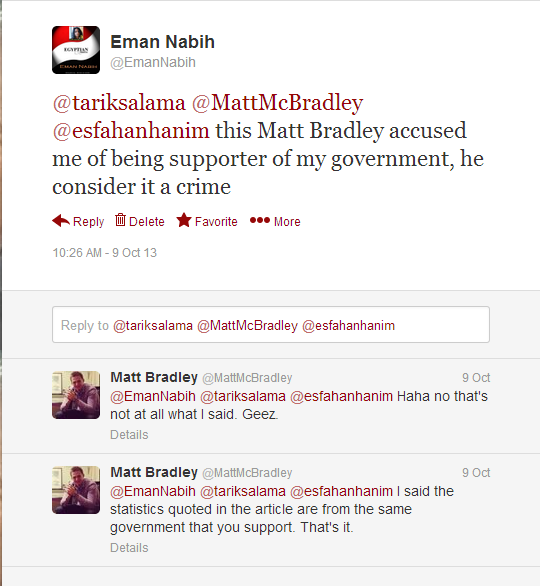 Matt MC Bradley accused me of being supporter to the government and I’m taking sides here! and my questions were nonsense, hysterical and rude! and he objected that I questioned the New York Times! What should be my comment to that accusation? 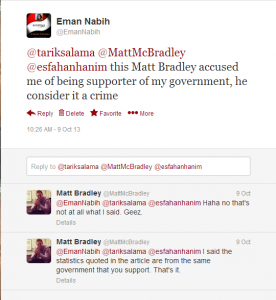 Except that, I do support my Military and my country against terrorism and I’m an Egyptian, and not Russian, Mr. Matt! 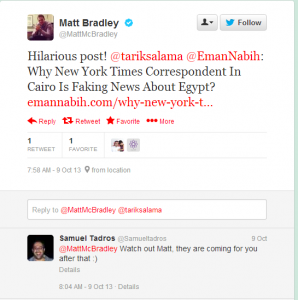 Maybe Mr. Matt was going to show me some respect, if I published that I’m a Muslim Brotherhood supporter and I’m a victim of the Egyptian Security forces and the Government, so he can show some respect and get his big story of another security forces MB victim, so it can match with the New York Times’ correspondent direct Accusations to the security forces!!! 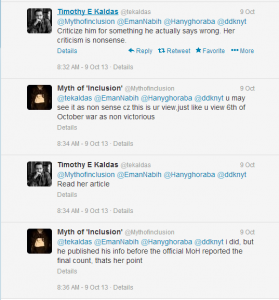 All those kings and queens correspondents of International News Medias in Egypt, wasted the rest of 9/10/2013 afternoon, in arguing and making fun of a nonsense, crazy, rude, hysterical article written by Eman Nabih, Egyptian Blogger of a third world retarded country, as they obviously consider it! Why didn’t you guys hard workers correspondents used all that wasted time in working for what you get paid for, instead of wasting all that time on that nonsense article of mine?! 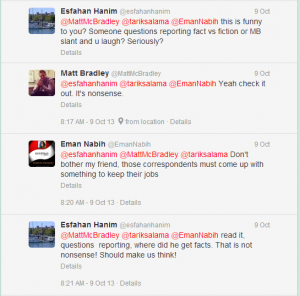 Do you get paid to offend Egyptians on the social medias, beside spreading fake news too!!! ?